I love my flock! Watching their funny antics, getting mobbed when I show up with treats, and being adored by a few lap chickens is rewarding, but being able to supply my family with delicious, healthy eggs from happy hens is one of the main reasons I keep chickens. Hens with access to fresh greens will give you tastier and more nutritious eggs than caged hens that subsist only on chicken feed. My backyard chickens are enjoying some fresh greens in the form of a head of lettuce that had started going to seed. Many flock owners don’t need to give a second thought as to how to supply their free-range chickens with fresh greens during much of the year, but not everyone can safely free-range their flock. Other flock owners, like myself, may live in more inhospitable areas without much grass. Even though my own hens are able to spend part of each day out in the backyard, my family lives in a hot, desert area, which means naturally growing greens are not that abundant. My chickens do seem to enjoy dining on the short bermuda grass that grows in my yard, but they enjoy eating the occasional wide-leaved weed and leafy greens even more. Thankfully there are other ways, besides letting our flocks free-range, for getting those nice, dark yolks. Gardening is one of them. Although leafy greens and other vegetables are healthy for chickens to eat, it is not a good idea to give your flock free access to your garden. Unfortunately, chickens are not careful to eat only what we wish and they can demolish your entire garden in one afternoon (trust me, I know). Besides devouring the tasty parts of your plants, they also love to scratch around and dustbathe in the soft soil. I’ve learned that I even have to lock up the flower pots, lest my flowers be dug up and all my nice potting soil be expelled from the pots during these dustbathing frenzies. Gardening for your chickens is still a good idea, as long as you offer the plants some protection. I keep a fence around my garden to keep the chickens and the dogs out and I throw out extra seedlings, weeds, and goodies to the chickens, who gobble them up. I also planted a My Pet Chicken’s packet of Chicken Salad Seed Mix for my hens last year and they loved it. 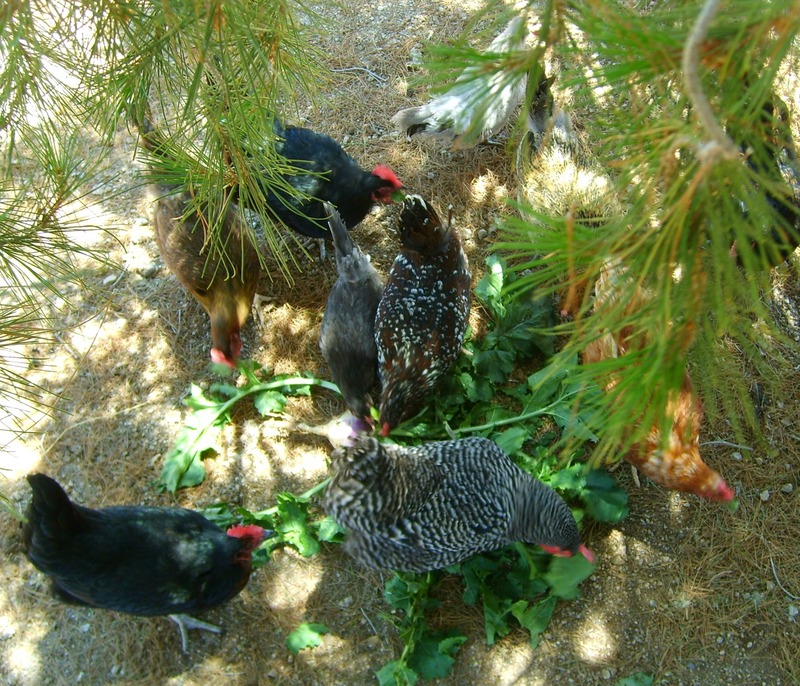 Last year, my hens thoroughly enjoyed fresh greens grown from MPC’s Chicken Salad Seed Mix. You can also try something like this Chicken Run Raised Bed, if you would like to build a special garden for your chickens to dine from. For the most part, fresh greens can be a healthy part of your flock’s diet, but some plants are not safe for chickens to eat. You can click here for more information on unhealthy plants and even a partial list of poisonous plants. You’ll also want to be careful about using chemicals to kill weeds and/or insects in your yard—these chemicals could be toxic to your chickens. Your chickens may be a bit of help to you in both areas—they like to eat certain weeds and chickens love to eat bugs too! Be sure to keep your lawn mowed—short grass is much safer for your flock to eat than long cut grass—long grass can cause an impacted crop. During the winter, when there are no plants left in my garden, I purchase a huge bag of spinach from a warehouse type store so that the hens still get some greens each day. 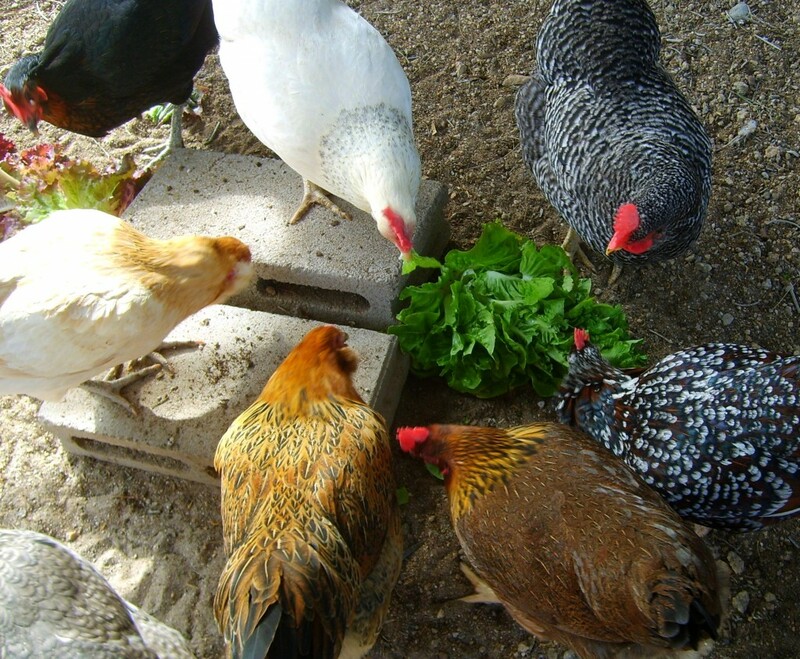 Besides fresh greens, there are many other healthy treats you can give your flock. What are some of your chickens’ favorite treats from the garden? Good advice! Love your chickens! Living in the East Bay once a year I toss a package of nasturium seeds into unused or weedy parts of the yard, they grow fast here which would be a problem without the chickens. Every couple of days I toss in an arm load full mid spring throug what passes for winter here. The horrible crabgrass that Californians call lawngrass gets tossed in on off days – with a bit of cutting because of the long grass issue. And of course all weeds the can be pulled or plucked. They love hollyhock leaves but hollyhock leaves with rust are only given when residue can be put into the trash rather than the home or city compost. Greens are cheap in the supermarket – 2 large bundles of parsely can be a dollar and the girls go wild. I live in the city, Memphis , TN to be exact, and I have several dogs also, so my chickens are not able to be free ranged…..The girls(14) live in a 5′ X 32′ run with a raised 5′ X 10′ X 8′ coop…. I raise lettuce, spinach, kale, and Kentucky Bluegrass in container gardens and am blessed with an empty lot next door that I keep mowed and use the raking from that as well to provide them with fresh greens….I also have a mulberry tree that grows over the run and they just love the fresh berries. My in-laws raise blueberries and always have an abundance so my freezer is full of them year round and the girls love a treat of a big bag of them! I am blessed to be friends with my local Kroger’s produce manager and he holds all the clippings and pulled fruit and veggies from the shelf and contacts me when he is about to “put them in the dumpster” so I can meet him out back and pick them up, this is a huge windfall for both the dogs and the chickens since my dogs love veggies of almost all kinds….. I grow extra kale in the spring to give my girls. During the summer I let them free range for part of each day and they like the dandelion leaves. For the winter I usually get some locally grown cabbage (we live in Colorado) and have it for quite a while in the fall and winter. To the person who talked about the parsley I used to feed that but have read that it is not good for chickens…not 100% sure why but I have stopped giving it to my hens. I make mine a salad every morning.. They never know what’s going to be in it. They luv it!! Mixed salad greens, added strawberries sometimes, Whatever is in the fridge that morning. Sprinkle it with oatmeal and seeds.